“At last! The small group world has finally been given rock solid research that proves what it takes to create groups that are gospel-centered, relationally bonded, evangelistically effective, disciple-making, and that multiply for Kingdom purposes. If you’re a senior pastor, groups pastor, group member, education minister, or a Sunday School teacher, I’m begging you to read this book–then do what it says to do. Read this book first! There is a plethora of fantastic books written by some of the best thinkers in the groups world. Read as many of them as you can. But, READ THIS BOOK FIRST! 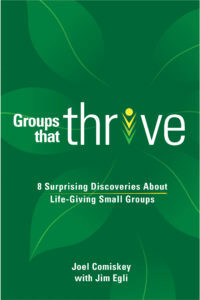 Groups That Thrive unearths indisputable research that will guide you to practices that create groups that really do evangelize and make disciples. The vision God has given me is to see, “A biblical small group within walking distance of every person on the planet making disciples that make disciples.” Groups That Thrive reveals the rock- solid research and the practices necessary to see this vision become a reality” (Rick Howerton, author, Small Group enthusiast, and Church Consultant with Kentucky Baptist Convention).